This is a frightening time for people who care about the essential elements of a democracy: a free press, respect for fellow citizens, civil engagement with each other despite differences, to name just a few. The demonization of the other is particularly disturbing. This is also a time, however, when people of conscience make themselves known and speak up against prejudice and injustice. 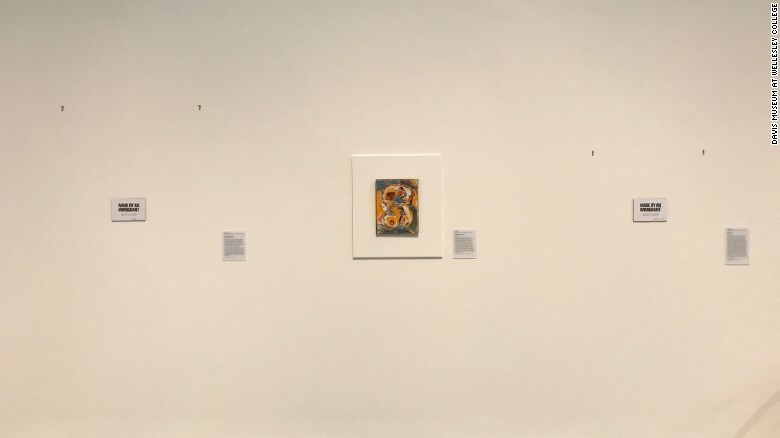 Which is why I was so delighted to see my alma mater, Wellesley College, highlight the substantial contributions of immigrants to the art of this diverse country. 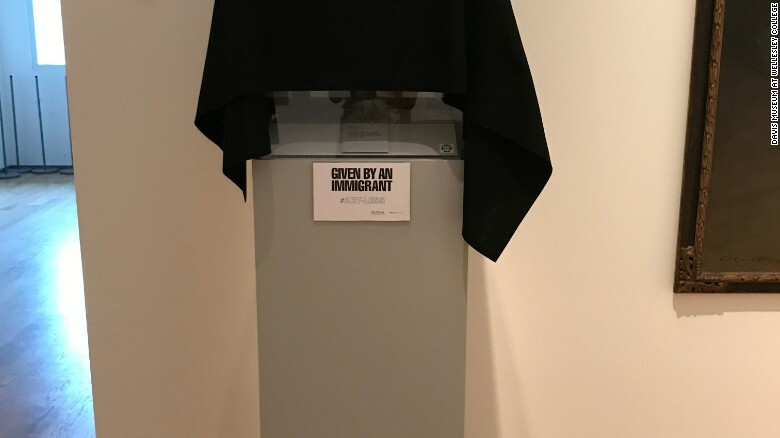 This week I proudly shared the news that the college’s Davis Museum had removed, or covered with black fabric, every piece of art created by an immigrant to the US. Why do I feel that this symbolic gesture is so powerful and why does it mean so much to me? To call me a proud Wellesley graduate says very little about me. I am also a South African cisgender woman of color, a warrior for social justice, a progressive feminist, a writer, and a legal permanent resident of the United States. I arrived at Wellesley a feminist activist and floundered for two years as I tried to find my feet in that predominantly white, upper middle-class, wealthy milieu. I was so different from my classmates: two years older because I had taken ‘A’ levels after high school in the hope of getting into a British university; the product of a highly-politicized society and a high school with a long history of political activism (when Soweto exploded in 1976, I was in 11th grade). But, eventually, I made a place for myself. How? Because my peers embraced this person with the weird accent who looked Asian and called herself ‘Black,’ who argued that newspapers sometimes lied and often concealed, who said one should defy morally illegitimate laws, who loved the music of Janis Ian and Frank Sinatra. They listened to me, I listened to them: we found a way to be friends. We’re still talking: 37 years later a group of Wellesley ‘84s in the DMV meets regularly for dinner. It also helped that the college was an affirming place for women and that I met faculty and staff who shared my worldview. Those professors have remained my friends. At lunch last summer I told the faculty member who influenced me most profoundly that, in my first class with her, “I felt my brain explode.” The feeling of kinship—intellectual, political, personal—was instantaneous, deep, and endures to this day. Which is why Wellesley means so much to me. She has given me so much and I feel part of her. And then, to have her embrace being home to “a bunch of dykes,” turn it around and proclaim the achievements of that same “bunch of dykes” tells me that my alma mater is still the open and inclusive environment I graduated from all those years ago. Wellesley’s visible recognition of contributions immigrants have made to art says, “This is what we lose without them here.” That is a powerful message. Today, in Washington and across the United States and beyond, people honored A Day Without Immigrants in various ways, some publicly and loudly, some quietly and privately. 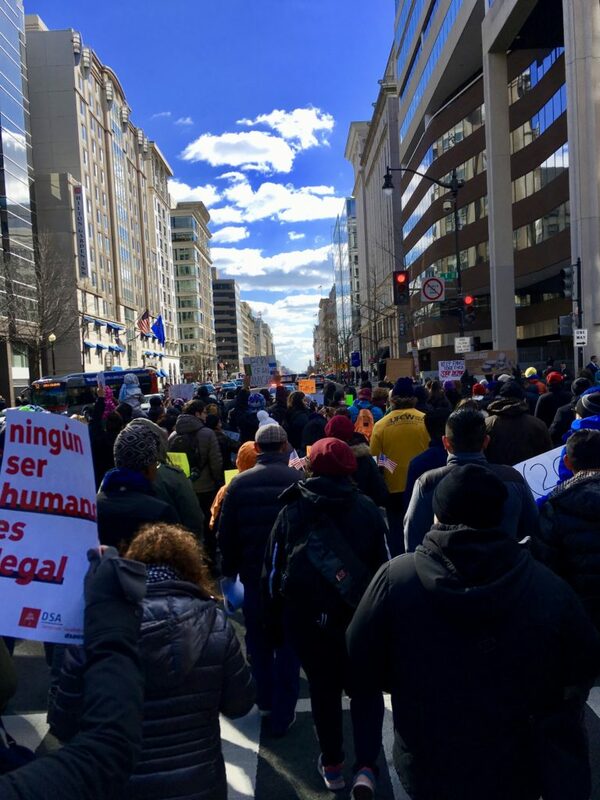 In Washington, a boisterous crowd marched and chanted for much of the afternoon, going from La Casa, a community center in the heart of the historic Salvadoran and Latinx community; to 14th and U Streets, a historic intersection of Black Liberation and Power histories and struggles; to a local Whole Foods, to engage with workers’ struggles; to the Wilson Building, which houses Washington, DC, municipal offices; to the White House. The journey from La Casa to the White House is incredibly short and impossibly long. In a few brief hours, that multigenerational, multinational moving body of moving bodies passed through and united entire centuries as well neighborhoods, continents, and populations. While a great deal of attention has been paid on the `hospitality industry’, and particularly restaurants, in Washington, the largest private employers are universities. In many cities, universities are the largest or among the largest private and public employers. While many of on the march work in hotels, households, transportation and restaurants, there were also engineers, writers, lawyers, doctors and teachers. We came from El Salvador, Guatemala, Honduras, Paraguay, Mali, Ethiopia, Eritrea, Nigeria, India, Pakistan, Portugal, Belgium, and the United States, to name only a few. Between chants, we shared stories of our various migrations and we shared stories of our “regular”, everyday lives. In Washington, as elsewhere, a Day Without Immigrants would close every university and college, every hospital and clinic, as well as restaurants, hotels, gas stations, grocery stores, all forms of transportation, and much more. I hope that our universities, colleges, and hospitals are as direct and courageous as many restaurant owners have been in their opposition to the criminalization and dehumanization of immigrants. Many restaurant owners have made it clear that the dignity and safety of immigrants cannot be merely an economic argument. That our economic lives rely on immigrants is not and cannot be the point. The point is that, despite ever growing inequality, we live together, and that, living together, is what community looks like and what democracy looks like. When we join our voices, whether in the streets or in the classrooms or elsewhere, we create and we become one beautiful voice. Many languages, one beautiful voice. This is what democracy looks like.